New BARC research finds that predictive planning is the hottest trend in the planning software tools market in terms of planned adoption rates. The Planning Survey 18, published today, is based on a survey of 1,465 planning users, consultants and vendors from 55 countries worldwide. It features analysis and comparison of 17 leading planning products based on user feedback, as well as current data on market trends and the selection and use of planning tools. The most important trending topics in terms of planned adoption in the future are ‘predictive planning’ (50%), ‘integration of strategic and operational plans’ (44%) and ‘simulation and analysis of scenarios’ (44%). 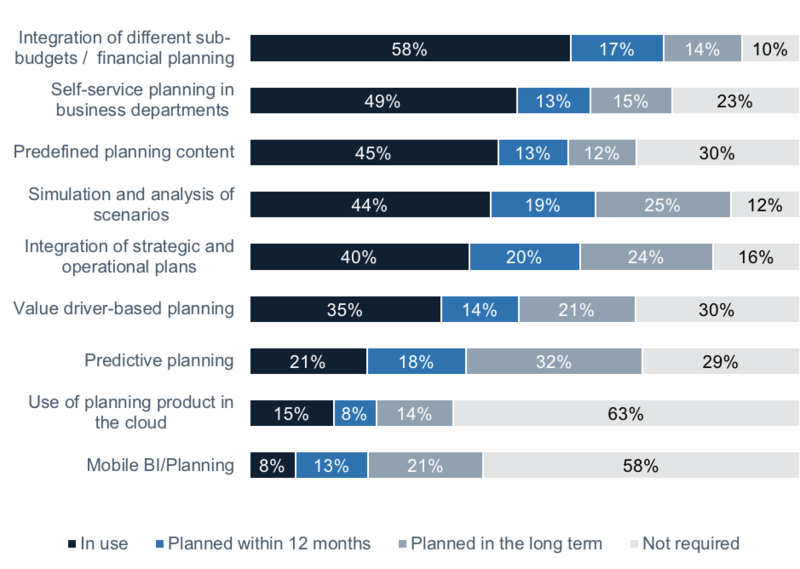 ‘Mobile BI/planning’, ‘planning in the cloud’ and ‘value driver-based planning’ trail some way behind (see Figure 1). Advanced planning topics such as predictive planning, integrating long-term strategic planning with short-term operational planning and simulation/analysis of scenarios are gaining in importance as many companies strive to achieve the next level in planning maturity. Software vendors are also reacting to trends in the market, which propels these topics even further. A better quality of extrapolations and simulations, the relief of planners through automated processes and easier identification and evaluation of drivers are the top three benefits companies expect from predictive planning and forecasting. Flexibility and planning-specific functionality are the two main reasons why companies buy their planning products (see Figure 2). The third most popular reason is ‘coverage of reporting/analysis requirements’, showing that many companies are aware of the fact that the integration of planning with reporting, analysis and dashboards is a vital element in effective planning and therefore has to be considered in the software selection process. Vendor-related reasons such as ‘good vendor relationship’ (8%), ‘corporate standard’ (10%), ‘size and financial stability of the vendor’ (10%) and ‘vendor or product reputation’ (13%) are now of minor importance for most companies selecting a planning product. Excel, which remains a widely used product for planning and BI all over the world, is rarely evaluated in a formal software selection process but is often chosen because it is available and users are already comfortable working with spreadsheets. Price-performance ratio is the top reason why companies choose Excel as their planning product (54%, see Figure 2) because in most cases it is already installed so no additional licenses need to be purchased. However, only 54% of users are satisfied with Excel as a planning tool, compared to 83% of users of specialized planning products (see Figure 3). The Planning Survey 18 is the fourth edition of BARC’s major annual study into the selection and use of planning tools. The findings are based on a worldwide survey of nearly 1,500 planning users, consultants and vendors, which was conducted from November 2017 to February 2018. It features analysis and comparison of 17 leading planning products based on user feedback, as well as current data on market trends and the selection and use of planning tools. The survey raised € 1,500 in aid of UNICEF as part of BARC’s pledge to give € 1 per survey completion to charity. The Business Application Research Center (BARC) is an enterprise software analyst and consulting firm with a focus on analytics/business intelligence (BI), data management, enterprise content management (ECM), customer relationship management (CRM) and enterprise resource planning (ERP). For over twenty years, BARC analysts have combined market, product and implementation expertise to advise companies and evaluate BI, data management, ECM, CRM and ERP products. A long-running program of market analysis and product comparison studies forms the basis of BARC’s comprehensive knowledge of all the leading software vendors and products, as well as the latest market developments and trends. Along with analysts CXP and PAC, BARC forms part of the CXP Group – the leading European group of analysts for enterprise software and IT services with staff in eight countries. For further information, visit www.barc-research.com/.